I did a dove release for another funeral today. Another unexpected death, possibly a suicide, but I don’t know. After I let the doves go, the funeral director said a few words. He mentioned that there are two times in the Bible. 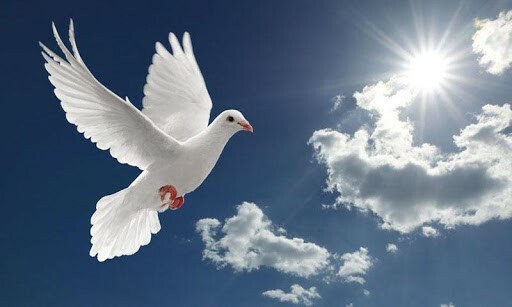 According to the biblical story (Genesis 8:11), a dove was released by Noah after the flood in order to find land; it came back carrying a freshly plucked olive leaf , a sign of life after the Flood and of God’s bringing Noah, his family and the animals to land. Also, when John the Baptist baptized Jesus Christ in the Jordan River, he saw the Spirit of God descending like a dove and alighting on him. The dove is a symbol for peace, and for coming home. When we release the doves at the gravesite, they circle around a few times, and then they fly home. Hopefully all of them arrive back at their home for their food and shelter before I even get back home. Just as the dove flies home, so do our spirits go home. Home to our heavenly home. I appreciated those words that he spoke, and told him so. I enjoy doing the dove releases. It’s peaceful and beautiful when they fly out of the box and circle around. What’s not peaceful and beautiful, however, is finding the cemetery and making sure you get there on time. Today’s service was in Eagle Mountain. That’s pretty far out there. I was there a bit early, and it’s a pretty small place, so it was easy to find the grave. However, a lady was supposed to give me cash or a check for the doves, and no one came up to me to offer me money (sad, right? But usually they pre pay or give me a check there). I texted Pam, the owner of Wings of Love, and asked if she knew who was supposed to pay me. I figured if I just stayed there after the dove release, the person who requested the doves would step forward. Nope. She was stuck at work, and could I meet her at the Maverick gas station. Hmmm. I texted her directly and said, yes, I would meet her at the Maverick gas station. I put Maverick Eagle Mountain into my phone and off I went. But then she called and asked where I was. Seems there are two Mavericks, and I was going to the wrong one. Oh, heavens. She asked where I was, and when I told her, she said, “Pull over. I’ll come find you. I’m in a big grey truck.” I told her what I was driving and said I would wait. I was worried for a little bit, thinking, that it sounded a bit like a set up for murder, but I figured, I would just stay in my car. When the big grey truck pulled up behind me, I had a flash of panic, but it was actually a lady carrying a check. Crisis averted. Pam will get paid, I will get paid, and the doves will fly safely home.